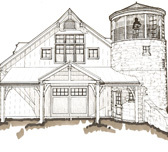 At any given time, Ekman Design has projects in various stages of design and construction. The construction phase is in fact the time when the architectural process is at its most exciting and most evident as the drawings and materials take form in three dimensions. The collaborations between the design team, builders, and craftspeople give shape to what was once merely the client's dream. Here are a few of the projects that are either in the minds, on the boards, or under construction.